At Sylva Trees we believe in leaving all work sites in as good a condition as when we arrived. We also have very strong concerns about environmental issues, so we do our best to recycle all our waste. We use a mobile wood chipper that reduces all wood waste to small woodchips, these are then used in gardening for mulching and weed suppressing. 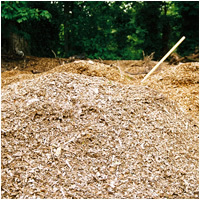 Our woodchips are used by Harcourt Arboretum, the University of Oxford's Botanical Garden, various people at the East Ward Allotments and other landscaping companies and gardeners.